Eagles are not ready to mate until they reach maturity. This happens as early as age 4. 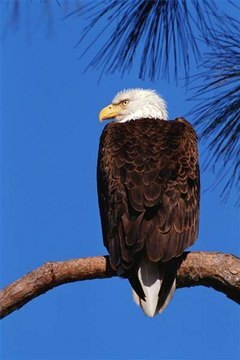 Eagles may live until the age of 30, and like humans, they choose a mate and stick with that partner for life. When one of the birds die, the other may find a new mate. When eagles are ready to mate, they build a nest. Like many birds, they come back to the same nesting location throughout life. Both the male and female eagles share the responsibility of watching over the eggs. Some birds will dance and do an acrobatic routine before mating. Eagles are known to do this as well. Then, the male eagle mounts the female eagle from the back. This usually happens on the ground or on a tree limb near the nest. Afterward, the female eagle lays her eggs. Eagles lay between one and three eggs. Although eagles could mate every year, some do not. Lindsey Mastis is a television news reporter and photographer in Washington, DC. She has worked in broadcast news since 2004, and holds a Bachelor of Science degree in journalism from Southern Illinois University at Carbondale.